Rishon LeZion (Ebreu: רִאשׁוֹן לְצִיּוֹן‬ (audio) (help·info), lit. First tae Zion), is the fowert-lairgest ceety in Israel, locatit alang the central Israeli coastal plain 12 kilometers sooth o Tel Aviv. It is pairt o the Gush Dan metropolitan aurie. In 2015 it haed a population o 243,973. Foondit in 1882 bi European Jewish immigrants, it wis the seicont Jewish farm colony established in Land o Israel in the 19t century, efter Petah Tikva. The name Rishon LeZion is derived frae a biblical verse: "First tae Zion are they, an A shall give herald tae Jerusalem" (Ebreu: ראשון לציון הנה הינם, ולירושלים מבשר אתן‎‎) (Book of Isaiah 41:27) an literally translates as the First tae Zion. ↑ "List of localities, in Alphabetical order" (PDF). Israel Central Bureau of Statistics. Retrieved 16 October 2016. 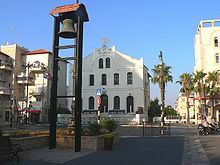 Wikimedia Commons haes media relatit tae Rishon LeZion. This page wis last eeditit on 5 Mairch 2018, at 03:41.